Although Japan officially celebrates New Year’s Day on January 1st, until 1873 Japan followed the lunar calendar used by China, Korea, Vietnam, and many other Asian countries. The Japanese calendar is still full of many holidays that mark various important dates in the traditional lunar calendar. One such holiday, Setsubun, is celebrated each year on February 3. In the past, Setsubun represented the last day of the winter months and the beginning of spring. Celebrating Setsubun involves the usual Shinto shrine visits, but you also toss toasted beans out your door and yell “Out with demons [oni]! In with happiness!” Pretty fun when everybody on your street is doing it! 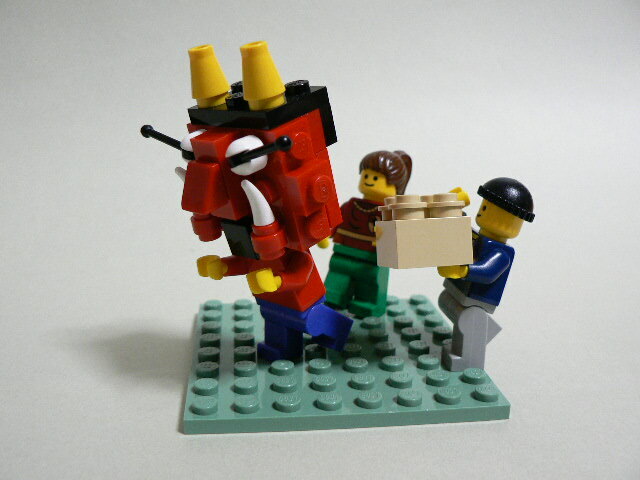 To honor Setsubun, a couple of Japanese builders have posted really cool creations.